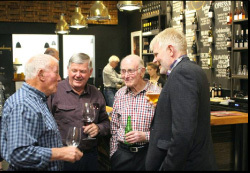 Urban Winery Visit by Taradale Rotary Club. There was some panic in the ranks when yours truly went down with the flu and had to back out of his reporting and photography duties. However a call to the team got the necessary responses and Harry Renfree provided report material, while Yvonne Dobbie and Diane Howell sent in photos. Guest Speaker Rob Pattullo welcomed Rotarians and Guests and introduced Tony Bish of the Urban Winery. Tony and his wife Karryn operate this busy wine based business. Tony gave a very complete story of his life commencing with University days, then surfing in Australia, running out of money, worked in the laboratory of a winery, back to Hawkes Bay in 1982 with Vidals, back to Australia again, a further 6 years at University then his big break came when he founded Sacred Hill Winery with the Mason brothers. While travelling in South America Tony discovered the substantial benefits of large concrete eggs, rather than the traditional wooden barrels, for aiding the maturation process as wine is aged. 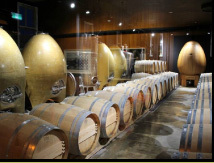 Interestingly, the egg shape gives a continuous flow to the wine as it ferments and ages and the thick walls provide good insulation which avoids the need for artificial refrigeration. NZ wines have gained predominance and now lead the world in the premium wines stakes around the world. Chardonnay has the best taste for a winemaker to work with, and the key to success is the addition of oak flavouring, and Urban Winery now has a large wooden egg made from 150-year-old oak from France. Traditional oak wooden barrels are also used at the winery. The oak wood contributes enormously to the chardonnay winemaking Hawke’s Bay Chardonnay the premium wine around the world. Tony called it the “King of Wines”. hows the egg barrels which the wine is stored in – a new way to store wine in New Zealand - to the right are the concrete ones which are old 1600 litres and at the back is the wooden egg which holds 2000 litres.